All the chatter going into the weekend seems to be about the Swiss National Bank’s surprise move to un-peg its currency from the euro. In his article What in the World Just Happened in Switzerland, Michael Snyder of the Economic Collapse Blog summarizes the move well. For the past 3+ years the SNB has been promising it would maintain their exchange rate at 1.20 francs to the euro, at whatever the cost. This has meant the SNB has had to purchase euros in order to keep the franc from appreciating. As a result, Switzerland has become the #1 buyer of euros. With the European Central Bank announcing plans for quantitative easing (money-printing), the SNB has thrown in the towel and removed the peg. This is bad for manufacturers because it makes exports more expensive abroad, but it helps Swiss savers because imports become cheaper and purchasing power goes up. Not surprisingly, many companies are saying this is a terrible idea while many individuals are happy. In Dave Fairtex’s PM End of Week Market Commentary – 1/16/2015, he compares the need for Switzerland to un-peg their currency to when Nixon un-pegged the dollar from gold. Gold was valued as $35 in the US but $43 everywhere else, which helped lead to a draining of US gold stock as people redeemed dollars for gold and got an instant 23% return. Basically, there comes a time when your artificial peg simply becomes too expensive for the country to bear. He also suggests that the move in Switzerland likely contributed to a very strong week for gold and silver, since gold and silver usually go up in demand during periods of economic uncertainty or turmoil. An turmoil there was: exchange rates went wild and many companies have suffered huge losses. So what does all this mean for the rest of world? As both Michael Snyder and Dave Fairtex suggest, it’s all about uncertainty. There has already been market turmoil in Switzerland, but since they were previously Europe’s #1 buyer of euro’s, this means that demand for euros could instantly dry up and as the law of supply and demand dictates, when demand goes down so does price. So, we can likely expect a continued decline in the value of the euro, which could be further destabilizing in an environment that is already fragile – especially with fears of countries leaving the EU. The world is so interconnected that a major destabilizing event in Europe could very easily spill over to the rest of the world, including the US. An Alternative to Peak Oil Thinking? Gail Tverberg, creator of OurFiniteWorld.com, was interviewed by Chris Martenson on January 17 and had some interesting things to say about peak oil. Most of the world has assumed peak oil would be associated with insanely high oil prices since as oil runs out it simply becomes more and more expensive to extract from the Earth. 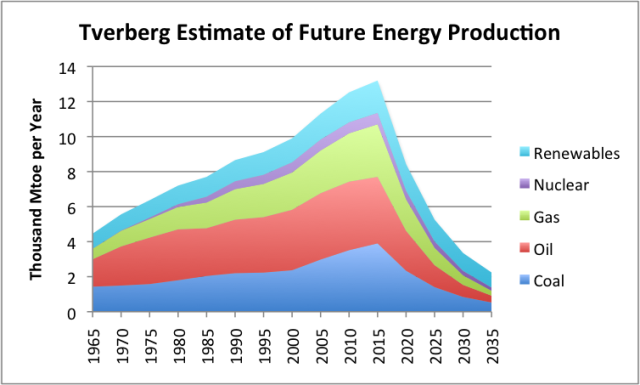 She, however, hypothesizes that peak oil could come about due to low oil prices. In a nutshell, she believes that low oil prices will trigger a financial collapse in a number of markets that causes the world to go into recession. Essentially nobody will be able to afford high oil prices because they won’t have the money to pay for it and, since oil has become so expensive to extract, it will lead to a drastic reduction in drilling. This prompted me to visit her blog, where I read her latest article Oil and the Economy: Where are We Headed in 2015-2016? In her article she suggests the slowdown in China and cessation of quantitative easing in the US has caused the world economy to slow. A decrease in other commodities such as coal and iron oar corroborates this. Such a downturn in the economy will prevent oil prices from rebounding and will wreak havoc in the financial markets leading to bank insolvency. This is somewhat realistic due to the fact that the shale oil industry is kept alive by junk debt and with oil prices well below break-even there are likely to be defaults on many of these loans. As banks turn to bail-ins, companies and individuals will see their accounts pilfered to keep the banks alive. This will be a feedback loop of deflation and lead to peak oil due to global inability to afford the prices necessary to keep many oil producers in business. This is an interesting thought that seems to make sense, although it’s the exact opposite of what others have put forward (such as Chris Martenson) in that it would be low prices bringing about peak oil rather than high prices. If it does play out this way, we are indeed in for quite the shock over the next 1-2 years.